Over the last few years, tons of new face mask trends have emerged, but it can be tricky to discern which ones actually help skin. We’ve gathered and reviewed the scientific research to explain what works and what doesn’t. What are they known for? Both charcoal and clay have unique absorbent properties, and their gentle drawing action can help dislodge debris from congested pores. A well-formulated charcoal mask or clay mask will leave your skin shine-free, but not dried out. These types of masks can feel temporarily “tightening,” but they should not leave skin uncomfortably taut. The downside? Some of these masks also include skin-aggravating ingredients, ranging from menthol to alcohol, eucalyptus, mint, and fragrance (both natural and synthetic fragrance is a problem for skin). Stay away from those ingredients and you’ll do fine. The upside? Charcoal and clay masks can be extremely beneficial for excessively oily skin or a shine-prone T-zone. Opt for a formula that also includes soothing ingredients, like our Pore-Clarifying Charcoal Gel Mask and our SKIN BALANCING Oil-Absorbing Mask. What are they known for? Well-formulated peel-off masks help gently remove a superficial layer of gunk from pores and a thin layer of dead surface skin without any problem. They can create a nice, smooth feel on skin. The downside? Homemade peel-off charcoal masks (sometimes called “blackhead” masks) have become popular, but some of them are actually downright scary for skin because they include an adhesive base made with glue, or even worse, superglue! Not surprisingly, this is terribly harmful to skin, and people have taken to the Internet to post videos of how painful they are to pull off. The upside? Gentle peel-off masks are fine for occasional use—but don’t hurt your skin with peel-off masks that contain polyvinyl alcohol in high concentrations and require aggressive pulling because those will aggravate and stretch skin. What are they known for? Brightening masks are intended to improve the appearance of uneven skin tone and bring radiance to a dull complexion. The best of them include concentrated combinations of effective brightening ingredients, such as arbutin, licorice, bearberry, and niacinamide. The downside? There really is no downside to these skin-brightening masks as long as they are free of any kind of fragrance and contain ingredients known for their ability to brighten skin! The upside? Brightening masks are excellent for anyone who wants to improve the appearance of uneven skin tone and get a glowing complexion. If this sounds like something you’re after, we suggest you try our RADIANCE Renewal Mask. What are they known for? Sheet masks are part of the Korean skincare craze that has swept the skincare industry globally. These fiber, rubber, gel, or cloth-like masks are saturated with skincare ingredients that you leave on skin for a period of time, allowing the ingredients to soak in before removing the sheet. The downside? Sheet masks tend to be messy and less cost effective than regular facial masks. Moreover, there isn’t any research showing that the delivery system has any advantages over traditional masks. The upside? A sheet mask can be fun for the novelty of it, but you can get the same exact types of ingredients in regular facial masks, which are more efficient at delivering ingredients to skin. What are they known for? The goal of a “sleep mask” is to lock in hydration and add anti-aging benefits (depending on the formula). The downside? There is no downside for this category. The upside? Keeping the beneficial ingredients on skin longer than a traditional, rinse-off mask means the ingredients in the sleep masks have more time to work, making them more effective. Our SKIN RECOVERY Hydrating Treatment Mask and Rehydrating Moisture Mask are both especially great options for normal to dry skin. What are they known for? Bubble masks typically have a gel-like texture that morphs into a bubbling foam due to the mix of solvents and perfluorocarbons in the formula. It’s a gimmicky effect, with zero benefit for skin. The downside? The worst bubble masks include ingredients that make your skin tingle so you think that they’re working, but that tingling is actually your skin telling you that it’s being irritated. The upside? You’re better off passing on this mask trend. What are they known for? Honey, coconut oil, turmeric, yogurt, oatmeal, and lots of other food-based ingredients are used in DIY mask recipes, claiming to be good for everything from acne to wrinkles. These homegrown masks are tempting because they’re perceived as natural and are inexpensive, but what are the benefits? If you’re using plant oils for your dry skin, that’s great, but that’s about it. The upside? If you like the idea of a DIY face mask that you can make right in your own kitchen, opt for ingredients that are rich in omega fatty acids and antioxidants, such as coconut oil. Use our Cosmetic Ingredient Dictionary to look up other good DIY mask ingredients. 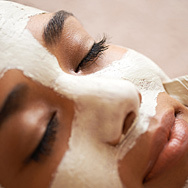 Learn more about face masks.